We are one of the prominent traders and suppliers of Leather Items. These items are manufactured using optimum quality leather at manufacturer's' premises. Our products are available in different colors, sizes, designs and patterns. The elegant looks of these products add to their demand in residential as well as commercial sectors. 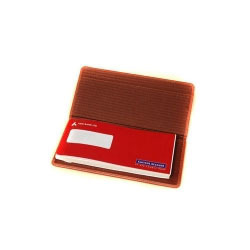 Our comprehensive range consists of Cheque Book Folder and Folder. We offer these products at industry-leading prices. Folder leatherite with handle with calculator pocket.